World War I took many lives from men who were fighting for Canada and a monument stands outside the Bank of Montreal in Winnipeg Square in the City of Winnipeg, Manitoba honoring these heroes. Approximately 60,000 Canadians died during the war and this Cenotaph is just one of many across Canada which symbolizes this hard period of time. 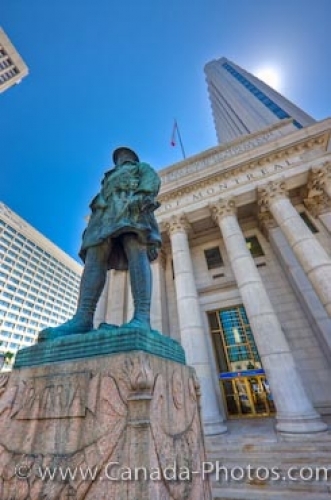 The Bank of Montreal is a historic building at the corner of Portage and Main Street, a main crossroad in Winnipeg Square, which attracts many visitors. This monument stops people in their tracks as World War I affected many lives from the past and still affects the lives of many in the present. Picture of a Cenotaph, a war monument outside the Bank of Montreal in Winnipeg Square, Manitoba. Cenotaph, a monument to the men that fell in the Great War 1914-1919, outside the Bank of Montreal (established 1817) in Winnipeg Square (underground mall), City of Winnipeg, Manitoba, Canada.